The Wildlands shirt & pant combination are crafted to keep you completely safe without losing mobility in any location that you find yourself being called to. Comfortable Details: Elasticized waist and a generous cut make for comfortable wear. Contoured Hem: Extra long front and back hem that can be tucked in or left out of pant. Convenient Pockets: Features spacious chest pockets, radio pocket and mic loop, as well as thigh semi-bellows cargo pockets. Maximum Durability: Major seams include double needle sewing for extra durability. 3M™ Scotchlite™ Reflective Material: Features reflective numbers, letters and trim in 1-inch or 2-inch solid colors or 2-inch triple trim. Advanced Protection: Adjustable hook and loop ankle closures keep embers, spark, and other debris from penetrating leg area. Ten-inch zipper bottom leg closures. Heat Protection: Self-locking, NOMEX® zipper fly closure with fabric shield to prevent heat transfer. Available in 6.0 oz/yd2 NOMEX® IIIA plain weave, 7.0 oz/yd2 Indura® Ultra Soft FR cotton, and 9.0 oz/yd2 Indura® Ultra Soft FR cotton (yellow). Nickel-plated brass snap-front closures with fabric shield to prevent heat transfer. Adjustable hook and loop wristlet closures keep embers, sparks and other debris from penetrating. Two spacious chest pockets with full coverage pocket flaps (hook and loop closure) and pen slot (left side). Extra long front and back hem that can be tucked in or left out of pant. Outer shell material hanger loop at neck. Major seams include double needle sewing for maximum durability. 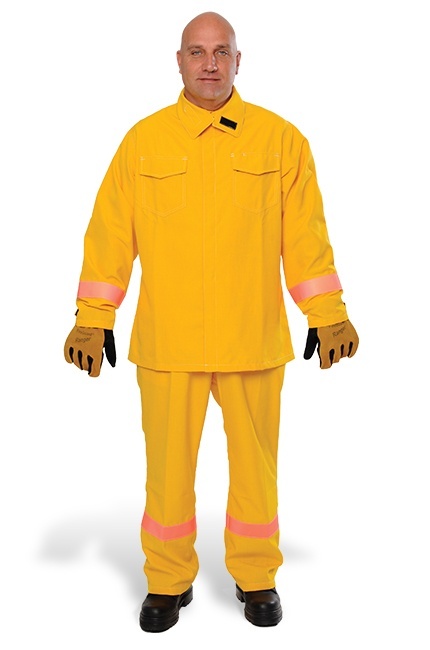 Available in 6.0 oz/yd2 NOMEX® IIIA plain weave and 9.0 oz/yd2 Indura® Ultra Soft FR cotton (yellow). Durable belt loops accommodate up to 2" belt. Two spacious contoured front slash pockets. Two large seat pockets fully covered by flaps. Self-locking, NOMEX® zipper fly closure with fabric shield to prevent heat transfer. Elasticized waist for comfort and flexible fit. Adjustable hook and loop ankle closures keep embers, sparks and other debris from penetrating leg area.